The view out my window is Skalholt Cathedal and this reconstructed chapel which is part of an archeological dig at one of Iceland’s key historical sites. On the horizon behind the chapel likes Hekla, one of Iceland’s most active volcanoes. In the middle ages, Europeans called it the Gateway to Hell. Hekla last erupted in February, 2000, but with luck, it will continue to sleep through the rest of the week. Mary and I are here for a different type of archeology – a dig into an ancient tradition of story. We are here with three other storytellers to explore Njal’s Saga, the account of a feud with tragic consequences, not unlike the American tale of the Hatfields and the McCoys. In both cases, events are based in history; we’re visiting some of the key locations mentioned in the saga. Njal was shaped by an anonymous author into the masterpiece of a unique tradition that influenced Tolkien, among others. 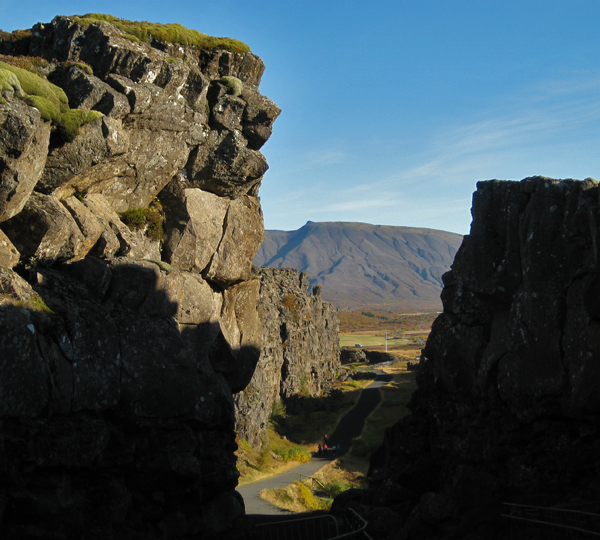 Meeting of the continents: the North American tectonic plate (left) meets the Euro-Asian plate at Thingvellir, Iceland. This week of the equinox, the temperature drops to freezing at night, but the guesthouse where we are staying is warmed by geothermal energy, by water bubbling up from hot springs that is shipped through pipes to cities and settlements throughout the island. Iceland is 99% energy independent. I’ll have more to reflect on in future posts, but meanwhile it is seven hours later than west coast time – tomorrow is almost here, so it’s time to log out. Please enjoy your week and stay tuned for future posts. 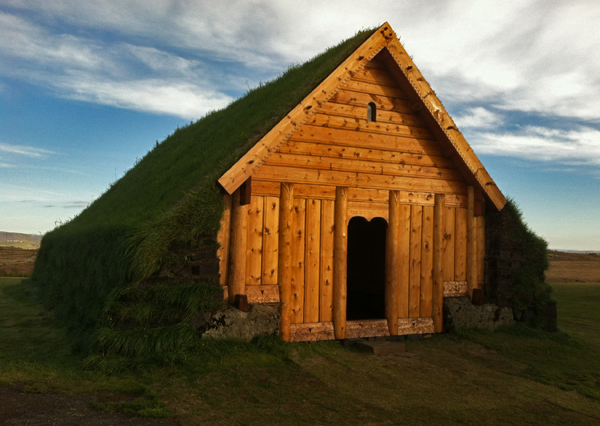 This entry was posted in Folklore, History, Stories, Travel and tagged 2012, folklore, history, Iceland, stories, travel. Bookmark the permalink. I can’t tell you how much I’m looking forward to hearing more about this adventure. It appeals to both the novelist and intellectual in me. Thanks for keeping us in the loop on this fantastic trip. Enjoy every minute and please post lots of pictures. Lovely photos! Looking forward to more!!! Enjoy your time there. Several more clear days, so there should be several more photos worth posting. Thanks for your interest!